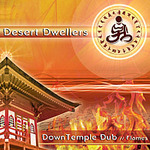 DownTemple Dub: Flames CD by Desert Dwellers is electronic dub & trance music with world rhythms for chillout, yoga and meditation. Rara and Amani's trademark deep bass, earthy percussion, etheric voices and culture-crossing instrumentation meet Treavor Moontribe’s insistent rhythms in this invigorating psy-chill soundscape. When Craig Kohland (Shaman’s Dream Ensemble) asked Rara Avis to compose music for a Duncan Wong yoga DVD series, Rara immediately invited longtime friend Amani to work with him. Their debut release, DownTemple Dub: Waves, was a pure reflection of this collaboration, while DownTemple Dub: Flames remixes earlier material written by Amani and Treavor Moontribe (aka DJ Treavor), the co-founders of Desert Dwellers. Both projects are the result of the Desert Dwellers collective’s ceaseless explorations into the uncharted realms of yoga dub.